Has demonetisation really boosted income tax collections? News reports have quoted government officials making claims about a record increase in the number of income tax payers in 2016-17. Should such claims be seen as a success of demonetisation in forcing unscrupulous individuals to become a part of income tax net? An analysis of direct tax collection statistics and income tax department’s income tax return (ITR) filing data calls for scepticism about any immediate claims of demonetisation leading to a dramatic turnaround in India’s direct tax collections. Union Budget 2017-18 has predicted an annual increase of 25.4% in income tax collections over revised estimate (RE) figures for 2016-17. RE figures for 2016-17 show an annual increase of 23.3% over 2015-16 actual estimates. These growth figures are the highest in this decade, and seen at face value, suggest a dramatic improvement in India’s income tax base in the past one year. 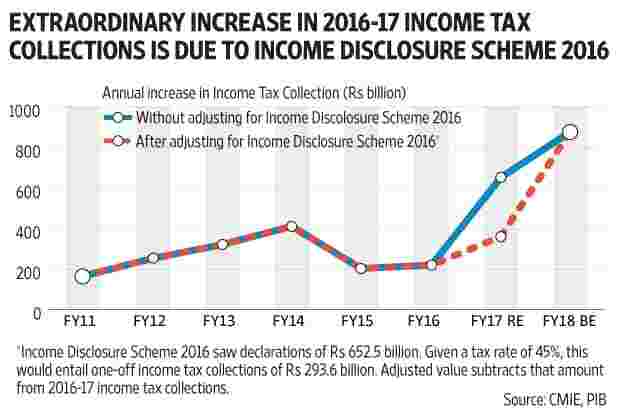 However 2016-17 income tax collections need to be seen in the context of Income Disclosure Scheme 2016, which led to the disclosure of Rs65,250 crore of undisclosed income. At 45% rate of taxation, the scheme would have brought in mostly one-time extra income tax revenue of around Rs30,000 crore. After adjusting for this value, the annual increase in income tax collections for 2016-17 seems more modest, and as a result, 2017-18 targets appear to be much more difficult. 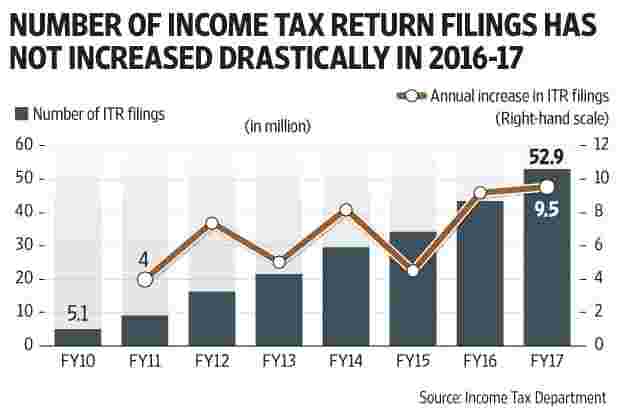 ITR e-filing data from income tax department shows that number of ITR filings increased from 43.3 million to 52.9 million between FY16 and FY17. In absolute terms, the increase is not significantly more than what was achieved between FY15 and FY16. To be sure, the ITR filing and payment process for the previous fiscal year is still underway and income tax returns/tax payments could continue to increase. However, data available till now does not suggest a spectacular increase in India’s income tax base due to demonetisation. It is reasonable to assume that a large amount of income tax evasion happens on account of non-salaried classes, as those getting salaries have their taxes deducted at source. The income tax department classifies ITR filings on the basis of type of tax payers (see details here). At present there are nine such categories, where ITR 1 and 2 represent individuals or Hindu Undivided Family (HUFs) earnings from salaries, interest, house income etc. 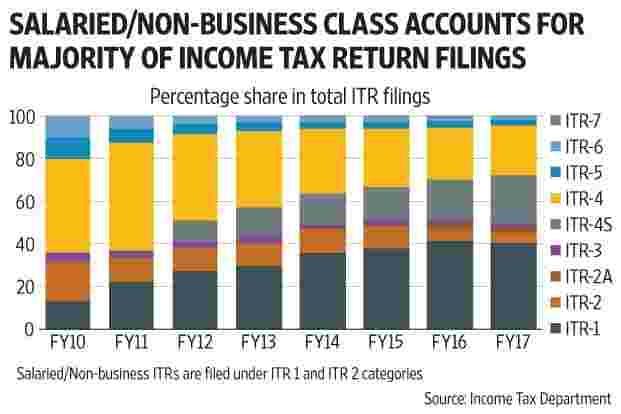 These categories account for close to half of ITR filings in the country. The ITR filing data for FY17 does not show any significant change in composition of ITR filings by different categories compared to previous years. To be sure, there could still be an increase in tax collection if such elements have been forced to declare their ill-gotten wealth (result of under-reported incomes in earlier tax-returns) kept in cash to tax authorities. But for any such increase to be inferred as a result of demonetisation and not one-off gain due to Income Disclosure Scheme, the trend must sustain itself for a few years rather than being a one-off thing. The short point is one must wait for a few years before declaring any significant victory for demonetisation in India’s battle to bring undisclosed incomes in the tax net.